Green beauty is a trend making waves in the industry, and I’ve been interested in exploring the "natural" side of lifestyle products ever since I started blogging (Ella's Botanicals, Best Moisturizing Oils). I also used to do a lot of DIY skin treatments, like this Oatmeal and Honey mask, which works beautifully to smooth and refine skin texture. In addition to choosing some products with simple, food-grade ingredients, I've transitioned from using a Clarisonic brush (with disposable brush heads) to a Foreo Mia to wash my face. Recently, I've been more mindful about waste, especially with bottles, boxes and packaging in general. Here are my 3 top products to help kick start your green beauty routine, focusing on less waste and more efficiency! I’ve mentioned before (Sibu Review) about how I adore bar soaps, especially for travelling. Most hotel body wash and soap can be incredibly drying, and I can’t remember the last time I checked a luggage on a flight. This means that I opt for liquid-less alternatives for my beauty bag at every opportunity I get. 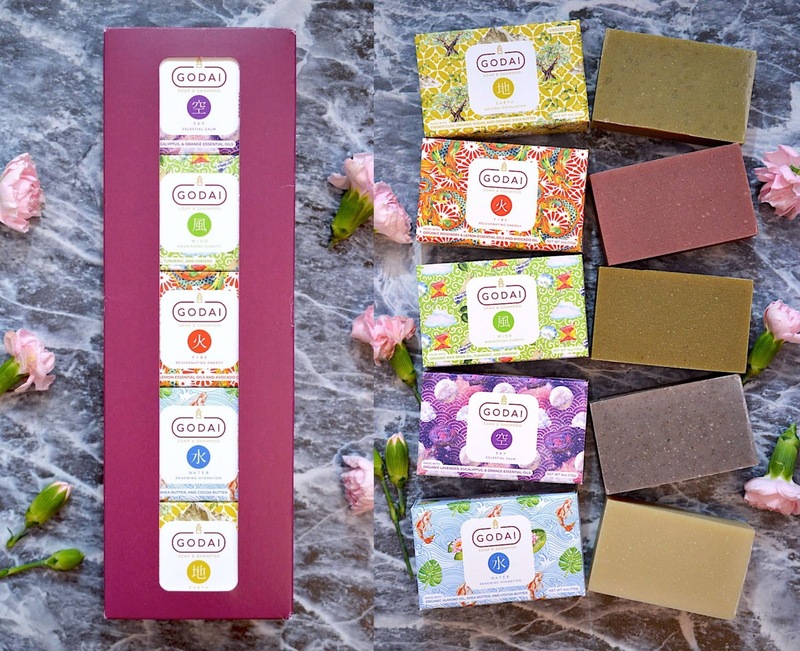 This GODAI Complete Gift Set contains five 4oz bars and they are arguably the best multi-use soaps I’ve tried. Great as a solid shampoo bar when you're in a pinch, and very gentle on the skin for hand and body use. The fragrance in these soaps is also AWESOME. Really delightful blends of natural oils that leave your skin fresh and delicately scented. The best part of bar soap is that you literally have no landfill waste here. The box is recyclable and the bar soap is made of natural ingredients. These soaps do not dry my skin out (thanks to natural oils!) and clean very well. No residue on my skin or hair. I started using reusable cotton rounds about a year ago, first discovering them on Etsy. They’re definitely becoming more popular now, with options coming out this year from brands like Bioderma. My favourite ones are made by my friend Nancy at Freon Collective. She’s a fellow Toronto Beauty Blogger and has a discerning eye for great fabric - these don’t soak up too much product, and wash really well. She even provides them in handmade wash bags to keep them in tip-top shape. This little mitt that came with my Omorovicza cleansing balm is awesome for gently scrubbing. The pretty patterns on Nancy’s Freon Collective cotton rounds will mask any makeup stains that hang around after use. Best part? They're only $35 for 15, a way better deal than the other brands I've found on Etsy. Doing the laundry can be a very non-eco-friendly task, when we realize how much water, energy, detergent and packaging we go through in the process. I've also realized that sometimes skin conditions can be aggravated by detergents, so opting for chemical-free alternatives like these dryer balls from NaturaPure can save both money and waste in the long run. These dryer balls soften clothes and reduce static, serving as a substitute for chemical-based fabric softeners. You can also add a few drops of natural essential oils onto the balls to add a light fragrance to your fabrics. There you have it. three of my favourite ways to reduce waste, with even better results than your original products. Which of these have you started to use?